Southern Mediterranean countries are exposed to increasing environmental challenges. Grey infrastructures have been used over the last decades to manage storm water and mitigate floods. Nature-based solutions (NBS), however, provide additional runoff storage/infiltration capacity relevant to address climate change impacts on future floods, while support other ecosystem services. 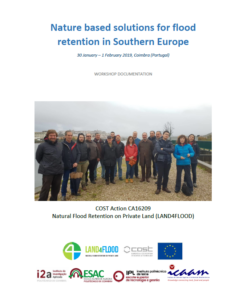 The workshop aimed to facilitate knowledge exchange between researchers, practitioners and stakeholders, including flood policy makers, representatives from farmers’ associations, regional flood protection agencies/enterprises and local decision makers from Southern Europe. It provided discussions about experiences and challenges to face and mitigate flood hazard, particularly using NBS – see the Workshop Report for more details.